I have an Air Venturi 90 cubic inch , 4500 PSI tank and was wondering what people do for tank protection. I find it odd that Air Venturi doesn’t sell something to help protect their very expensive air tanks, or other vendors for that matter (Omega, Benjamin, etc.). In the paintball world there are several options for tank “gloves” which I might be able to repurpose for my pcp tank. Otherwise I may end up doing a custom neoprenen cover myself. Also, the reg on my tank is factory set at 2900 PSI output. Is there a anway to inrease the output pressure to let’s say 3000-3200? Thanks. I then bought strap set with foam bumpers for it. I made this for my 90ci Benjamin tank. Mine fits in a camelback backpack. 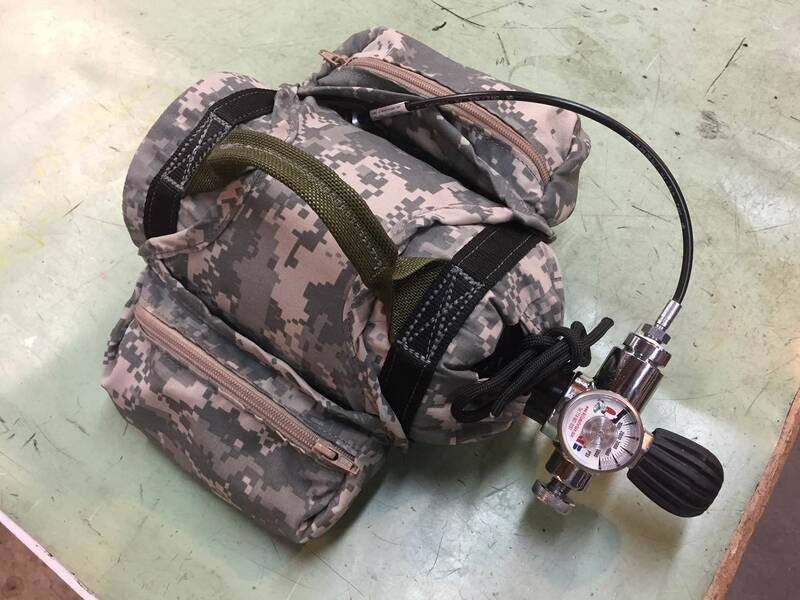 AirTanksPlus has a nice bag custom made for the 88 and 90 cu in tanks. Not too pricy at $34.00 + shipping. Your small bottle cost 9 to10 times that. This reply was modified 1 month ago by vdwb. I like yours best. Very talented. Props to Loren…your custom bag is killer. Wish vendors sold gear like that. I found something that might work from Valken. Anybody try shimming the stock regulator for increased output pressure? 2900 psi would be fine shooting directly from the HPA tank, but I mainly just use it for cylinder refills on my PCP. Would like to top off my cylinder at 3200 psi. Right now I can only fill to 2900 from the tank, then have to hand pump the rest to get up to 3200 on my gun. Props to Loren...your custom bag is killer. Wish vendors sold gear like that. Here's what I made for my 72cu.ft. tank. It's easy to carry and won't roll around or bang the ends. 2×6 cut 1/4" larger the tank diameter. Scuba carrying handle with straps screwed to 2×6 with 2×4 to keep straps apart.Cost 20.00 for scuba tank carry handle. Here's what I made for my 72cu.ft. tank. It's easy to carry and won't roll around or bang the ends. 2x6 cut 1/4" larger the tank diameter. Scuba carrying handle with straps screwed to 2x6 with 2x4 to keep straps apart.Cost 20.00 for scuba tank carry handle. I made one for my a/v 90ci from an old wetsuit. It aint pretty but it is protected. Good enough for me. I made a standup box for my 60. I take it when teathered or heading up north for a weekend. I need to make something simular for the Scott 30. The brown pack holds my 90cc Venturi that I carry with me for my Mrod/Prod or other 2900 guns. The black pack holds my 4500 Ninja 70 cc bottle that works for any guns. I like it for carring when I am hunting with a bigbore. It gives me a couple fills in the field. WOW, you have mad talents! Those protective / carry bags you have made are REALLY nice! I'm sure there would be people lining up to buy those if you ever decided to market them. I thought what I came up with was nice until I saw what you did. Loren’s tank bags are very well made. Last year I decided to get out of PCPs, and sold my tank and bag, but that was a mistake, and I’ve been drawn back……..so, I got another tank and Loren was the next person I contacted. This will be my second tank bag and should be on my doorstep tomorrow. Loren’s tank bags are very well made. Last year I decided to get out of PCPs, and sold my tank and bag, but that was a mistake, and I’ve been drawn back........so, I got another tank and Loren was the next person I contacted. This will be my second tank bag and should be on my doorstep tomorrow. You are very, very talented with a commercial sewing machine. Your tank bags are awesome! There is a market for those. I use pool noodle and have the harness custom made. Cheap foam works to keep from rolling around, gives a little protection and a handle makes it easy to carry. This reply was modified 1 month ago by stoti. This tank stand was made using scrap wood, bungee cord, and dowel rod for spacers. The 6.8L tank is padded around the base and shoulder using ventilated rubber shelf liner cut to fit. It is covered by 2 gray knit ski caps with a hole cut in the top of one cap for the valve. The two ski caps were hand stitched together around the middle of the tank. The rubber handle velcro strap costs $13 from an online scuba supply shop. Two large zip ties are to keep the velcro straps tight. Total cost was about $20. This reply was modified 1 month ago by Humdinger.